Amasa was accused of the murder and stood trial in February of 1874. 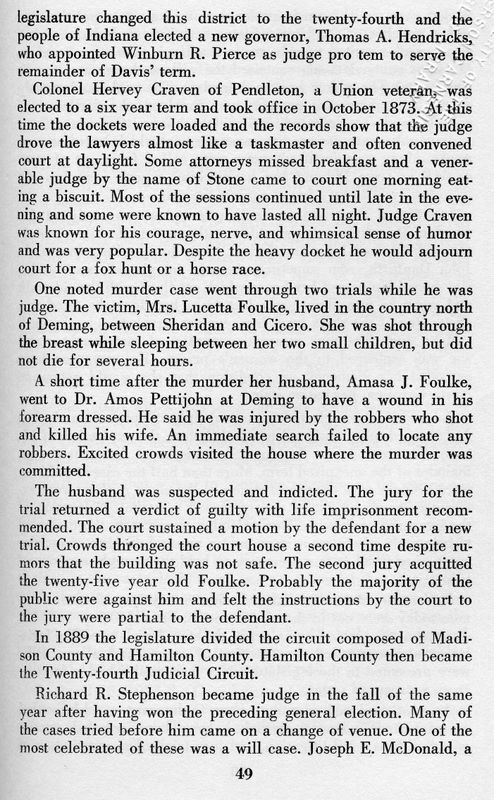 Amasa was convicted and sentenced to life in prison at this first trial. He was granted a new trial on 24 Feb 1874 which took place in February of 1875 where he was found not guilty and set free. S5 Newspaper: Indianapolis Sentinel (Indianapolis, Marion county, Indiana) "Murder a Mysterious Case the Trial of Amasa Foulke Charged with the Murder of His Wife" Date: Monday, February 15, 1875 Paper: Indianapolis Sentinel (Indianapolis, Indiana) Volume: XXIII Issue: 229 Page: 8. www.genealogybank.com, accessed 18 Nov 2007. Acc000975/Doc3845.pdf. One noted murder case went through two trials while he [Judge Hervey Craven] was judge. The victim, Mrs. Lucetta Foulke, lived in the courtry nrth of Deming, between Sheridan and Cicero. She was shot through the breast while sleeping between her two small children, but did not die for several hours. A short time after the murder her husband, Amasa J. Foulke, went to Dr. Amos Pettijohn at Deming to have a wound in his forearm dressed. He said he was injured by the robbers who shot and killed his wife. An immediate search failed to locate any robbers. Excited crowds visited the house where the murder was committed. The husband was suspected and indicted. The jury for the trial returned a verdict of guilty with life imprisonment recommended. The court sustained a motion by the defendant for a new trial. Crows thronged the court house a second time despite rumors that the building was not safe. The second jury acquitted the twenty-five year old Foulke. Probably the majority of the public were against him an felt the instructions by the court to the jury were partial to the defendant. Extract: The Independent Attempts, from a communication signed "Jackson Township," to create the impression that J. R. Gray had taken it upon himself to secure the establishment of a precinct at Baker's Corner, in Adams township, at the request of the Foulke family. This precinct was established by the commissioners at their last session upon the petition of thirty citizens in the immediate vicinity of the place. They are old men, many of them, and good citizens; and what is more, many of them are Democrats, Reformers, and Anti-Secrets. The petitioners working in the matter recommended the appointment of John B. Foulke as Inspector. Mr. Gray and Mr. Hall were both opposed to the establishment of the precinct, offering as a reason that two precincts in a township that size was certainly enough, and an unnecessary expense was incurred by making another. Mr. Gray took it upon himself to notify such of the citizens of Adams township as he could find upon the streets, and asked them to come up and oppose it. Some of whom did so. But the Board finding no special opposition from the township, and through a desire to accommodate the petitioners, established the precinct. And if anything, it is against the interest of the Republican party. Mr. Gray has repeatedly said that no lawyer should be permitted to extortion off of the county as Dave Moss attempts to do every time he gets a chance. That the tendency to employ lawyers in criminal cases at such enormous figures, as has been practiced in our courts, is wrong, and ought to be abandoned. That when an attorney is appointed to attend to criminal cases, a just compensation only should be allowed by the courts, and not such fees as private parties might pay. Judge Craven appointed Moss to attend to the Foulke case [Amasa Foulke, ID0097] and after the trial he referred the further prosecution to the commissioners. The Board tried to employ Moss to continue before they spoke to any one else. And they considered his fee exorbitant and could get no concessions form him; they then employed Judge Garver & Losey for less than half the amount Moss demanded. They considered Garver & Losey competent, and did not propose to allow further extortion upon the treasury. Of course, the Independent is grieved that its corps o' editors could not get another grab. S12 News Article. Amasa Foulke. The Cambridge City Tribune (Cambridge City, Wayne County, Indiana), 30 March 1876, page 3, Col. 4. http://www.newspapers.com/image/#15128889, accessed 26 Apr 2014. S13 News Article. Amasa Foulke. The Indiana Herald (Huntington, Huntington County, Indiana), 29 March 1876, Page 3, Col. 3. http://www.newspapers.com/image/#40066295, accessed 26 Apr 2014. Noblesville, Ind., Feb. 24, 1874. -- Judge Craven has granted a new trial to Amasa J. Foulke, found guilty of murdering his wife at this term of the Hamilton county circuit court, on the ground, first; that two jurors had in violation of the instructions of the court, taken notes of the evidence given before them, as asserted by two affidavits, filed with the court, and not denied by the State. Second; that according to the affidavits of three persons, a juror, Joseph White, had formed and expressed an opinion and that expressed opinion, was that "he could not see how the defendant could be innocent." Third, that the evidence, of the jury was not sufficient to sustain the verdict, and from the evidence he did not believe the defendant guilty of the crime with with he was charged. The court made an exhaustive review of the evidence and facts relied upon by the state for conviction, both in their argument before the jury and in their opposition to the motion for a new trial, with the above result. The defendant was recognized to appear at the next term of the court in the sum of $5,000. The case of Foulke having been disposed of the case of Jackson, indicted for the crime of murdering his wife was called, a jury impaneled, and the evidence is now being heard. There are three persons in Hamilton county now charged with the crime of slaughtering their wives; one waiting a new trial, one upon trial, and one awaiting a preliminary examination before a magistrate. The attorneys that were defending Foulke are now representing the state. For the defendant, Messrs. Moss & Drissal, Evans & Stephenson, Thompson & Thompson; for the state, Prosecuting Attorneys Stafford, Thomas Kane, Augustus F. Staats and William Grover, The opinion of Judge Craven in the Foulke case is approved by every well read lawyer for sound law, as the present supreme court reversed the case of McDonald cheek for the first reason stated in his opinion and the case of Mrs. Cleve for the last session as reported in 35th Indiana. DEATH BED CONFESSION OF A MURDERER. Nashville, Ind., March 14. -- Tom Barker, who was sentenced to, Penitentiary from this county for two years for grand larceny, but was afterward granted a new trial by the Supreme Court, and on a change of venue went to Madison county, which resulted in a commutation of his sentence to thirty days in the County Jail, has made a confession on his death-bed of the murder of Mrs. Foulke over a year ago, at which time her husband, Amasa Foulke, was arrested for wife murder, tried, and sentenced to prison for life, but was acquitted upon a second trial. It seems that Barker was one of the number who attempted to rob Amasa Foulke on that eventful night, and Barker shot Mrs. Foulke to prevent her giving the alarm, he fearing that she had recognized him.